Last month the University of Pittsburgh announced that Daren Ellerbee had been appointed as the Homewood Community Engagement Center director. The first of five CECs is projected to be established and operating in Homewood and servicing surrounding neighborhoods by spring 2018. The CEC, according to its website, is Pitt’s method of deepening its commitment to being a partner and resource to its surrounding urban neighborhoods, city and region. Established in neighborhoods like Homewood and the Hill District, the CECs will be geared to forge strong partnerships between Pitt’s educational and research assistance and community leaders who are working to help their neighborhoods thrive. The result is a place-based strategy that will enrich the university’s core educational mission, coordinate and enhance existing engagement efforts, and help to alleviate some of the most enduring challenges of Pittsburgh’s urban neighborhoods. 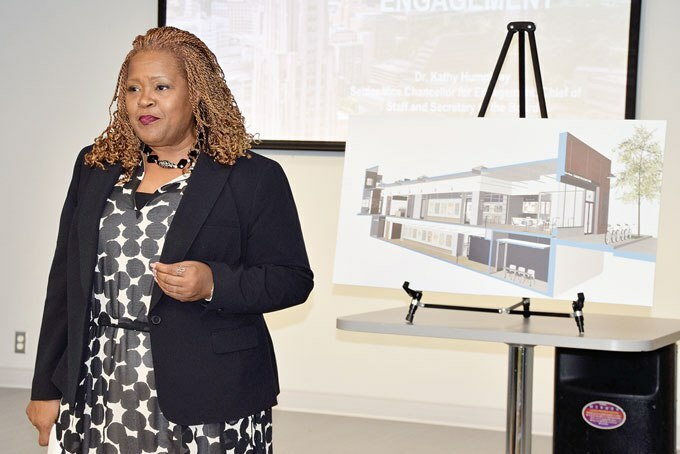 During a recent informational session held at the Homewood-Brushton YMCA, Dr. Kathy Humphrey, senior vice chancellor for engagement, secretary of the Board of Trustees, provided an overview of the CECs and introduced Ellerbee to an audience of approximately 75 people. Mentioning that the project is still in the organizational process, she is encouraging feedback from the community as plans move forward for the Homewood CEC. Humphrey explained that the CECs are a part of new chancellor Patrick Gallagher’s strategic plan to strengthen communities. Other points include advancing educational excellence, engaging in research impact, promoting diversity and inclusion, embracing the world and building foundational strength. As a result of the strategic plan, Humphrey said the goals of the CECs are to improve Pitt’s ability to partner with the community, develop methods to communicate Pitt’s impact to the community, provide services within the community based on what Pitt does to add value, provide more opportunities for students to practice at the top of their license and in doing so to serve the community, and create more synergetic opportunities for Pitt researchers and community. With a lot of work remaining, Humphrey indicated that milestones have been accomplished. Also, meetings are occurring with community leaders in Homewood seeking interest and listening to their needs. A Pitt faculty advisory committee to gain insight and input from each school has been formed. Homewood partners have been identified with an interest in having Pitt operate in their facilities. A heat map has been designed detailing Pitt’s community engagement and urban research. And a Homewood Advisory Council of 17 members to gain insight from community leaders and residents has been organized. As a CEC director, Ellerbee will be responsible to serve as a conduit between the university and the community, have knowledge of community and partnership opportunities for Pitt, attend community events and assure that the center is active within the communities they serve. Prior to joining Pitt’s Office of Community and Governmental Relations, Ellerbee was community affairs and equity specialist at the Urban Redevelopment Authority. The position afforded her the opportunity to build relationships in Homewood and other neighborhoods such as Hazelwood, the Hill District and Larimer. She described her former position as connecting community members to resources provided by the URA. The upcoming Homewood CEC will be located at 622 N. Homewood Ave. The Alma Illery Health Center, on Hamilton Ave., and Tioga St. will be satellite sites.